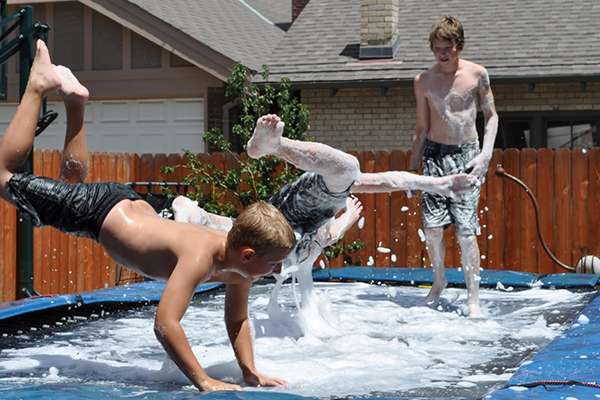 Can You Put Soap On a Trampoline to Make a Slip 'N Slide? 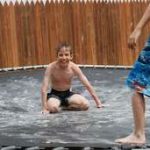 » Can You Put Soap On a Trampoline to Make a Slip ‘N Slide? So you want to turn your trampoline into a slip ‘n slide. We can relate! That’s why we’ve decided to answer one of the most pressing questions people have about trampolines: can you put soap and water on a trampoline? After all, using the wrong thing on a trampoline mat can indeed cause it to deteriorate more quickly. But we’re not going to let that stop us from having fun, are we? We’ll just make sure not to use soap with potentially damaging ingredients. So let’s talk about which soap would be safe to use on a trampoline. Is It OK to Put Soap on a Trampoline? Tell Us About Your Slip ‘N Slide Trampoline Experience! As we’ve already noted, some things could damage a trampoline mat. However, those are mostly harsh chemicals. We have to keep in mind that trampolines are made to withstand us throwing out weight on them for years and even decades without breaking. Still, since most types of soap we might use on a trampoline don’t have any seriously acidic and dangerous chemicals in them, there’s no reason to worry. No, soap won’t ruin your trampoline — so that’s the end of that mystery. Most of the soap we have in our homes can’t seriously damage a trampoline. However, we do recommend protecting the metal parts from rust before you try to make a slip ‘n slide trampoline. You see, if a trampoline doesn’t have a galvanized frame, the water would be much more damaging than the soap. If you own an older trampoline model, start by checking for any existing rust. Then, if you find any, sand it off and clean it with alcohol before sealing the area. You can also apply a water repellent all over the frame, just to be safe. Now that we’ve established soap isn’t going to derail your attempt to have fun on a trampoline slip and slide, let’s talk specifics. Which are the best soap brands to use on a trampoline mat? As it turns out, going for liquid dish soaps is our best bet here. We’ll want to use a gentle formula, but also one that can foam up for optimal performance. What’s the point of using soap and water on a trampoline if it’s not going to create a slippery mess? Well, we have just the right dish soap for the occasion. Dawn dish soap lets us have the best of both worlds. We get to have a deliciously foamy surface to jump and fall on. Better still, the soap’s gentle formula isn’t going to harm the trampoline mat. It’s a win-win! Ultimately, choosing the dish soap brand you want to use is completely up to you. Dawn has many different scents, and it’s incredibly affordable, but if you know of any better options, go for it. The best thing about using dish soap is that jumping on a slip ‘n slide trampoline will also effectively clean the mat! Finally, let’s talk about how to set up a trampoline slip and slide. As far as we know, there are two ways to get soap and water on a trampoline. You can use a garden hose to spray down the mat and add soap until the surface is foamy and slippery. However, those who want to take a more hands-off approach can put their garden sprinklers underneath the trampoline mat. The water will soak through the mat from the bottom, and you can put soap on top. We’ve also seen some people putting soap and a sprinkler on the trampoline. Still, you should avoid doing that if you have a small to a medium-sized model. If you’ve never made a slip ‘n slide trampoline before, you may not be aware of the special ingredient in all of this. Trust us — water and a few drops of soap aren’t really going to do anything. The secret ingredient is enthusiastic participation. So after the trampoline mat is good and drenched, hop on with your bottles of dish soap! Yes, bottles. Then just keep adding soap and jumping on the mat to work it into a foam. The more soap, the more foam! As long as we keep these safety tips in mind, we can just enjoy ourselves. After you find your legs on all that foam, you can also add ice, balls, or water guns into the mix. These props open up new avenues of fun you can have, and you can also try to play some of the many trampoline games. When you’re ready to jump off and hit the shower, you can simply rinse the trampoline mat until the water isn’t soapy anymore. Sprinklers won’t do much good in this step, so you will have to blast the trampoline with a garden hose. Fortunately, dish soap is quick to wash off, and it’ll even leave your mat squeaky clean! We’ve told you everything we know about creating a trampoline slip and slide. Now we want to hear from you. 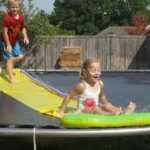 Have you ever made a slip ‘n slide trampoline? Which soap did you use? Tell us all about the experience in the comments down below. And to keep the fun going, please share this post with your friends! Don't forget to check our 50 fun things to do on a trampoline guide.